Are you ready to get your grub on at the Grape Festival? 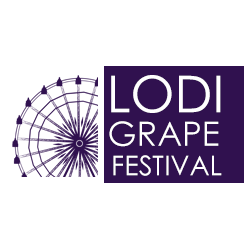 The annual event, which began as a community gathering to celebrate the grape harvest, now serves up insane fair food, local brews, and Lodi wine to enhance your experience. You are going to want to bring your appetites because the Grape Festival takes foodie fun to new heights. Mouth-watering treats like crunchy sweet funnel cakes topped with whipped cream and dusted with powdered sugar will satisfy your sweet tooth. Looking to beat the September heat? Grab a refreshing shaved ice. Craving local eats? Head over to Lodi’s Moveable Feast, where you can order up their crazy good loaded fries and chicken pesto sammy! Or, step up to the Lockeford Sausage booth, another local foodie favorite, and order an enormous Smoked Dakota sausage, housed in a pillowy bun and begging to be slathered in mustard. And the Tacos, we can’t forget the tacos. The Grape Festival is the only place to find those rolled soft tacos you devour in seconds. I mean, they are le-gen-dary! Take our advice and head to the Grape Festival to fulfill all your gluttonous cravings!